This is a sponsored post from Acorn Influence on behalf of Impressa®. As always, all opinions are 100% my own. The upcoming holidays offer plenty of reasons to become stressed out and anxious. From the gifts not yet purchased or wrapped, to the pile of cookie exchange invites, potlucks, ugly Christmas sweater parties, office parties, travel and holiday programs, we want to do it all and oh yes, have some fun along the way! Often, the biggest source of holiday stress is preparing the holiday dinner and hosting guests at home. Our needs often get pushed way back as we ramp up to go into Super Woman mode. This year, both of my children got engaged and will be getting married next year which is wonderful. I’m going to be a mother-in-law! This holiday season, I will be getting to know their families too and whew, it just feels like I have a lot going on. If you are like me and about the same age as me, that stress can lead to our worry about leakage or stress urinary incontinence (SUI). Of course, this is a common female problem which causes us to fret about losing our sense of freedom, making one feel old, or just want to stay home and lose our sense of spontaneity. Now there is the first product of its kind to come along which offers the ability to stop leaks and gain confidence so that we can enjoy all of the activities that come with the holidays. I have so much to be thankful for this year and I don’t want to miss any of it. I’m too busy to worry about leaks, so I found a way to deal with it and get back to all the things I need to do. I’m looking forward to celebrating this joyous season with my expanding family. Very candidly, Impressa helps to prevent leaks before they happen. Impressa Bladder Supports are a non-absorbent, removable product which is inserted like a tampon. It gently lifts and gives support to the urethra. The added support to the urethra helps prevent urine from leaking. Impressa comes in three different sizes which adjust to your unique internal shape, and once you find your right size, your leakage may decrease or even stop. Perhaps many women have felt that their bodies were failing them as there was no perfect solution to preventing leakage. Now we don’t just have to live with the problem. 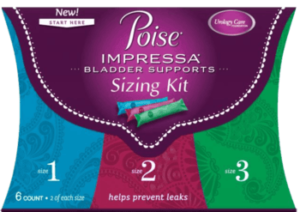 Give Impressa a try and check out the sizing kit at Walmart. Now there is no excuse to stay home or to deal with embarrassing leaks. If you want to get more information about Impressa, start with www.walmart.com/impressa. You’ll find plenty of information about how the product works, the “do’s and don’ts,” how actual product users have benefitted for Impressa, hygienic concerns, how to purchase and much more. 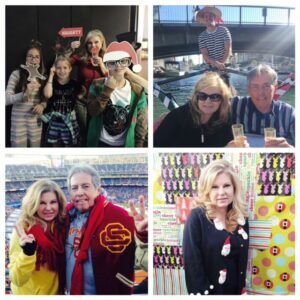 Follow along on social media with #LivePadFree @walmart and @poise. Oh wow! That’s amazing. The idea behind Impressa is great, and I love that they even have a sizing kit. Very cool. Thanks for the information on Poise Impressa. Looks like a product that cares about the customer needs. Bladder support products have come a long way. I’m at that age where I need to use a product like Impressa. Thanks for the heads up, I’ll check them out. I’ve never heard of this but its such a great idea! I’ll definitely have to pass this along to others who I know could use the product! I was wondering what SUI was. It’s amazing they have products to prevent leaks before they happen! You learn something new every day. I never knew that Impressa helped prevent bladder leakage. I saw these in the store and always thought they were tampons. Very good to know. I’m over 50 and you never know when this problem could arise. I have never heard this called SUI. I love that Poise is making products to help with this, it’s a topic never talked about. You do have a lot going on! The holidays can be so stressful. It is always good when you can find a product you know you can rely on. Thanks for sharing your personal experience! What a great product for those who suffer from SUI. I don’t have this yet, but I know I will experience this at some point in the future. I’m sure you’ll make an amazing mother-in-law! I haven’t heard of Impressa before, but it sounds like a really great product for people who have to deal with SUI. I need to try the Poise bladder support. After, my son was born, I started having issues with LBL and SUI. It is embarrassing. Thank goodness, there is relief with products like the bladder supports or pads. I like the fact there is such for Poise bladder support – not every pads have such – so that is something really good to have. Impressa is a fantastic product. It is helping so many women. My friend uses them and she feels like she has her freedom back. Sounds like a great product for those with lbl. Great to know there are other options out there. I’m sure these would be a lot nicer for some. Love that you’re being open and honest about this – hope you have a wonderful holiday! glad there’s something out there to help those who have this problem : ) Everyone should enjoy the Holidays!